This week, students from Philadelphia’s Mariana Bracetti Academy Charter School crossed the Delaware River to present their underwater rover project in Trenton, N.J. 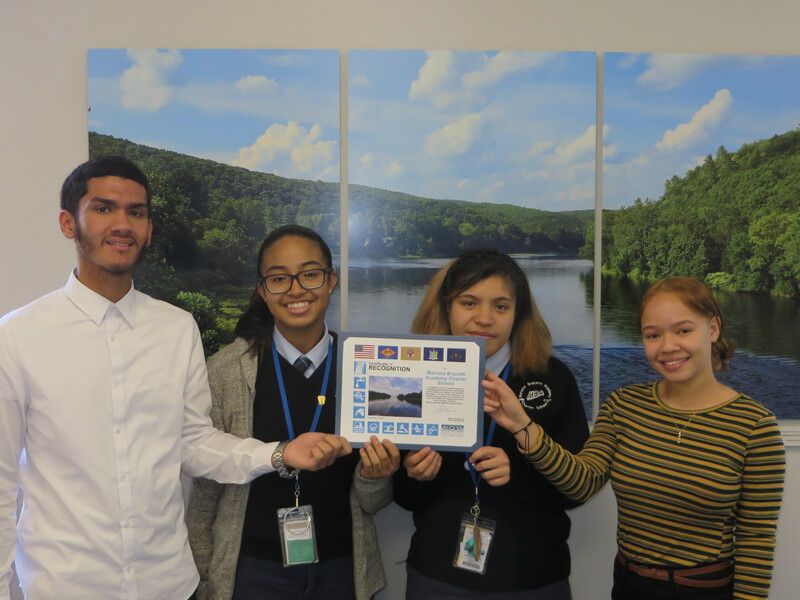 The students dropped some submersible science on the Delaware River Basin Commission (DRBC), an interstate agency that regulates the protection and conservation of the Delaware. 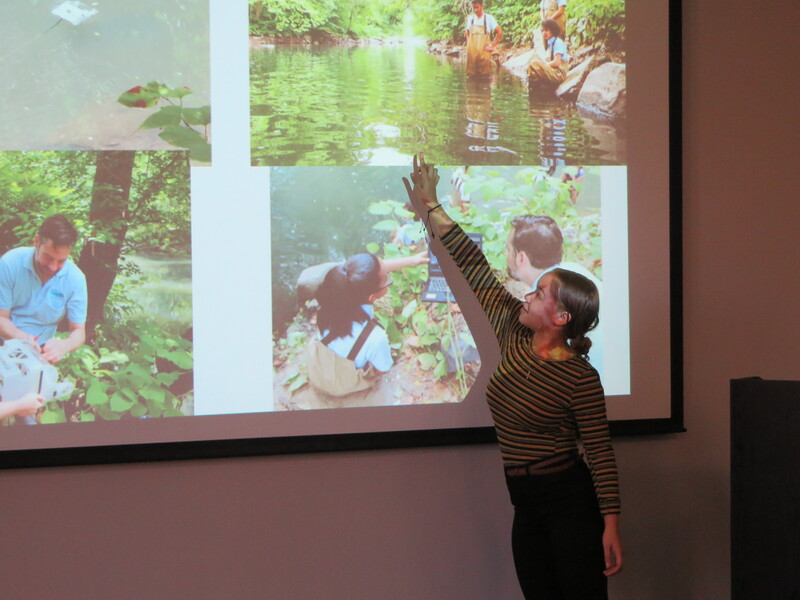 In front of an impressive group of hydrologists, biologists, engineers and other DRBC staff, the 11th and 12th graders detailed last year’s progression from working with Arduinos, sensors and motors to building the OpenROV kit and launching it in Frankford Creek to observe aquatic life. 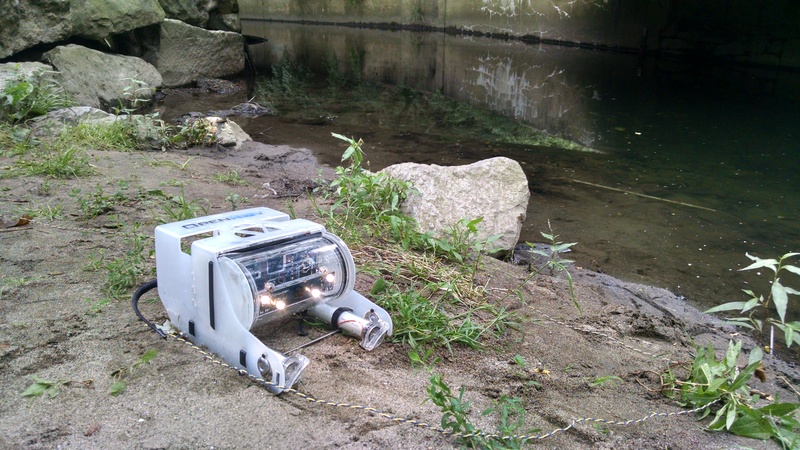 The audience had plenty of feedback, including suggestions for mounting dissolved oxygen and pressure sensors on the rover, as well as a possible (and long sought-after) nickname: Frankie, after its maiden voyage in Frankford Creek. Thanks to DRBC for recognizing all the time and effort put in by the Mariana Bracetti STEM club. 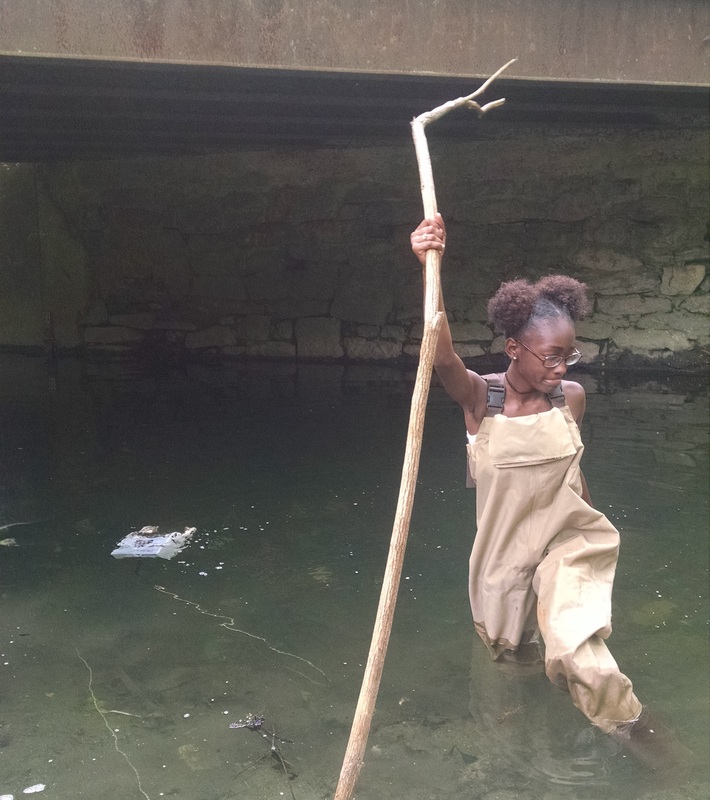 This week, the underwater rover built by high school students at Mariana Bracetti Academy Charter School embarked on its second voyage (read about the maiden voyage here) in Naylors Run, a tributary of Cobbs Creek in West Philadelphia. This time, the rover pilots were high schoolers spending the summer training as Watershed Stewards, a new program coordinated by the Philadelphia Water Department and the LandHealth Institute. The Watershed Stewards will spend 11 weeks learning about ecological issues and ways to protect our waterways and environment, and then look to (re)engage peers and residents with the creek during outdoor programming. Given the game controller that operates the submersible rover, the Stewards took immediately to learning the controls and executed some of the vehicle’s best maneuvers yet. As the rover dived into a pool, it captured streaming video footage of catfish, satinfin shiners and other fish species. It also revealed one of the creek’s biggest challenges: trash that has accumulated in the creek. 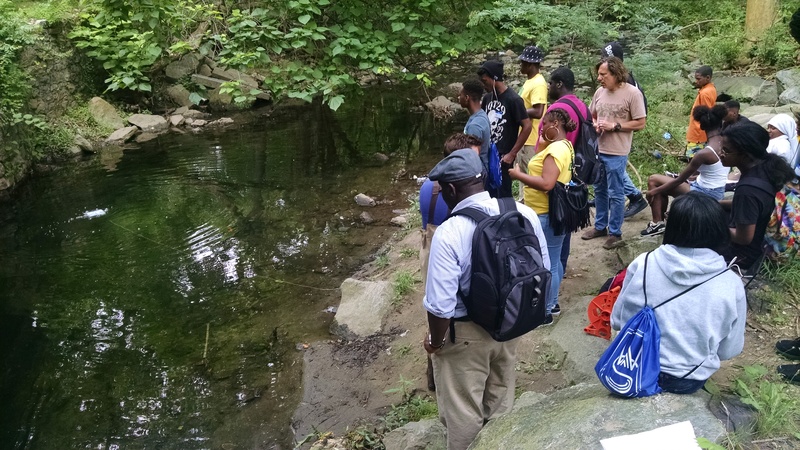 By documenting the conditions of Cobbs Creek, the Watershed Stewards can plan the best way to address the issues facing the benthos (the aquatic organisms at the bottom of the creek). Using technology and looking at ecosystems as a whole are two important ways that the rover stays connected to its initial mission from the Climate & Urban Systems Partnership (CUSP), which funded the rover’s construction. Warmer air temperatures, stormwater and combined sewer impacts, algae blooms and other contributors to poor water quality are related to climate change. With the rover’s unique underwater perspective, Philadelphia students are making observations today that could prove valuable to researchers and problem-solvers.